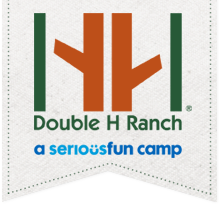 This August and September, CrossFit Aevitas is proud to support the DoubleH Ranch with a fundraising effort to send (at least) one kid to camp! The Double H Ranch is an Adirondack Summer Camp for children with life-threatening illnesses. The Ranch was co-founded by Charles R. Wood and Paul Newman in 1993, and provides specialized programs and year-round support for children and their families. Since the Ranch opened, it has served over 60,000 children from around the world. The Ranch is currently providing specialized programs and medical services for over 2,100 children and family members through year-round programs, which include Summer Camps, Adaptive Winter Sports programs, and even a Hospital Outreach Program for children in the hospital or medical-based setting. The Double H Ranch provides ALL of its programs FREE of charge to the kids and their families. Without help of volunteers and fundraising, the camp would not be able to provide such magical experiences for the kids who really need it. Every year, our very own Aevitas Athlete Kevin McKay joins a Ragnar Relay Team in honor of, and to raise money for, the DoubleH Ranch and their programs. This year, the entire CrossFit Aevitas community is going to have the chance to help Kevin - and most importantly - to help a kid attend camp! Our goal is to send one child to camp, which means a fundraising goal of $2,100!Yes, this will be a challenge, but our community is strong and WE CAN DO IT! Join the Team. You’ll need to create an account with your email and password. You’ll also go through a short questionnaire/waiver (because the page is set up for the Ragnar Relay). Complete the steps and you’re in! Copy the page URL or use the buttons to share your fundraising page with friends and family via email and social media. On Saturday, September 15th, we will host a pay-to-WOD ADAPTIVE WORKOUT for all you competition hounds (and your friends as well!) Yes, there will be PRIZES for this one too! 9:00AM - come in a few minutes early for a presentation from a Double H Ranch representative, including a short video highlighting just how awesome this cause is! 9:15AM - Adaptive WOD! $20 gets you in. You choose Scaled or Rx division. Every man and woman for themself! There are two ways to participate in this fundraising effort, and also two ways to WIN! As always, we’ll stay to party in the gym after the WOD. This time will be a potluck-centered event, so if you have a dish to share, please bring it! We hope that you’re as excited about this amazing cause and event as we are! Challenge accepted? !